Oh caffeine! I’m the first to admit it, I need my coffee and any coffee related gift would be a win with me! 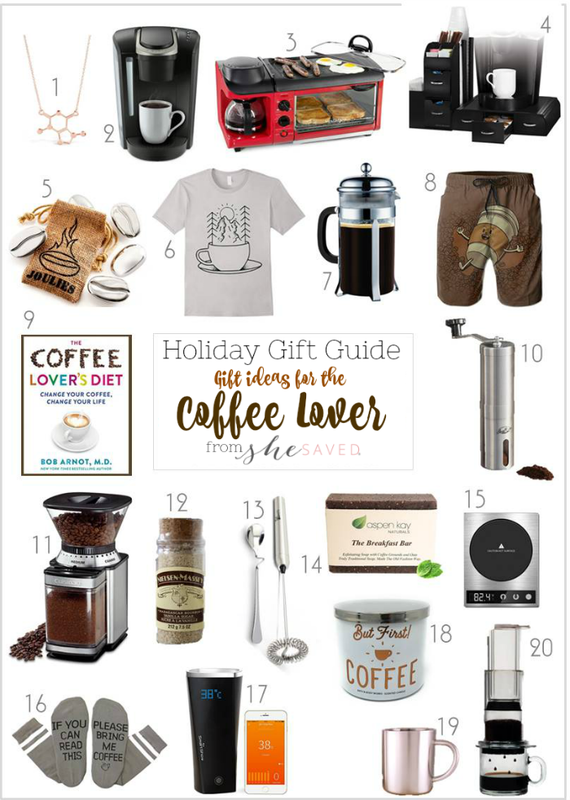 If you have a coffee lover on your list, you might really like some of these fun gifts for the coffee lover, everything from stocking stuffers to coffee makers so something for all price ranges and coffee drinker age groups. I know that I would appreciate any of these gifts, and you can’t beat Amazon for customer service and delivery (you don’t even have to fight the crowds at the mall!) Looking more great gift ideas? Check out my 2017 Holiday Favorite Picks and also make sure to check out my Holiday Gift Picks for Mom as well as my round up of favorite gift ideas for the baker on your list and don’t forget gift ideas for your favorite book lover and my gift guide for the fashionista. Also, make sure to check out my gift ideas for TEEN GIRLS and my gift ideas for TEEN BOYS. « Vegan Leather Tote Bag $39.99 + FREE Gift + FREE Shipping!